Dial-A-Teacher: You can get free help with homework in all subjects - in ten languages. 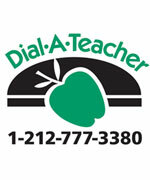 Call 1.212.777.3380 Monday thru Thursday from 4:00 pm to 7:00 pm, or visit Dial-A-Teacher Online which is available on school days, Monday -Thursday from 4:30pm to 6:30pm. Read Alliance Tutor: Reading tutoring in New York City, NY. Customized private in-home tutoring by highly-credentialed tutors in New York City, NY. Read Alliance Tutor will help you learn Reading through one-on-one tutoring in the comfort of your own home or any other location of your choice. Call 917.215.4373 to find out more about Reading Tutors.